J&D Produce Inc. is issuing a "precautionary, voluntary" recall of cilantro packed between November 30 and December 6. (CNN) -- A Texas produce distributor has recalled nearly 7,000 cases of cilantro and curly parsley after samples in Quebec, Canada, and Michigan tested positive for salmonella, the company said Monday. The latest recall comes days after dozens of people fell sick after consuming bacteria-tainted alfalfa sprouts in an apparently unrelated situation. The "precautionary, voluntary recall" announced Monday pertains to cilantro and parsley from J&D Produce, Inc., packed between November 30 and December 6, the Edinburg, Texas-based company said in a statement. Cilantro and parsley processed and branded as Little Bear between those dates can be taken to retailers for a full refund. No one has reported getting sick from eating the vegetables, according to J&D Produce. Also Monday, the Food and Drug Administration announced a source of a salmonella outbreak that had sickened at least 89 people in 15 states and the District of Columbia. Health officials said those first cases became known November 1, with many getting ill after eating alfalfa sprouts in products from Jimmy John's Gourmet Sandwiches outlets. 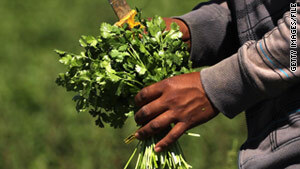 The FDA said Monday that those vegetables came from Tiny Greens Organic Farm. Tiny Greens' alfalfa sprouts and spicy sprouts (which have alfalfa sprouts plus radish and clover sprouts) were distributed in 4-ounce and 5-pound containers to farmers' markets, grocery stores and restaurants including Jimmy John's. In addition to a variety of sprouts, the Urbana, Illinois, produce company distributes arugula, broccoli, fennel, cauliflower, onion, radish and other items, according to its website. In a letter to Jimmy John's franchisees, founder Jimmy John Liautaud said that the chain had pulled sprouts from all its Illinois establishments after store locations came up negative for the bacteria. About 23% of those sickened in that outbreak were hospitalized, the Centers for Disease Control and Prevention said last Thursday. No deaths have been linked to the outbreak. The FDA said Monday that the sprouts were distributed in Indiana, Iowa, Missouri and possibly other Midwestern states, with roughly half the illnesses occurring in Illinois. The separate J&D Produce recall, meanwhile, came after independent tests found salmonella on the company's parsley in Quebec and its cilantro in Detroit, Michigan, both of which came from the same processing line in Texas. The company's products are sold retail as well as to wholesalers, who may then distribute them to restaurants and other establishments, according to Sharon McNerney, a public relations consultant for the company. The recall involves 2,498 cases of the parsley -- which have expiration dates 12 days after being packed -- that went out to the Canadian provinces of Quebec and Ontario and the U.S. states of Connecticut, Massachusetts, Michigan, Missouri, New Jersey, New York, Ohio, Pennsylvania, Rhode Island, Texas, Washington and Wisconsin. After the positive results, regulators and health officials in the United States and Canada have stepped up inspections of J&D Produce's facilities, the company's president, James Bassetti, said. They also undertook other measures, including stopping and sanitizing all production lines, adding manual inspections, rinsing products more and bringing in consultants. "We have a good track record, but we'll bring our expectations and standards to even higher levels," he said. "We've already begun improving our systems." In addition to cilantro and parsley, the Texas company gathers, packs and distributes a variety of fruits and vegetables such as carrots, limes, eggplants, peppers, greens, onions, melons, mangos and asparagus, according to its website. Those with questions can call J&D Produce at 956-380-0353. Salmonella is a bacterial infection that usually lasts four to seven days. About 40,000 cases of salmonellosis are reported each year in the United States, according to the CDC. Those who get it typically develop fever, abdominal cramps and diarrhea between 12 and 72 hours after becoming infected. Most people recover on their own, without needing significant treatment. But salmonella in very young and very old people, as well as those with weakened immune systems, can lead to severe illness and even death. The CDC recommends that anyone suspecting he or she may be ill from eating contaminated food should talk to a doctor.